Open the pages of a used textbook and it’s clear which passages contain the most important information. Just look for the fluorescent yellow trail left behind by a student’s highlighter. It’s that same principle—highlighting what’s most important—behind the introduction of SenoBright, GE Healthcare’s contrast-enhanced spectral mammography (CESM) technology. SenoBright, which received FDA 510(k) clearance in October 2011, produces contrast-enhanced images of the breast using an X-ray contrast agent and a dual-energy acquisition technique. 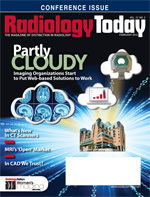 “Just like a highlighter, the contrast highlights and enhances areas where lesions are likely to exist,” says Anne LeGrand, GE Healthcare’s vice president and general manager of X-ray products. SenoBright uses X-rays at multiple energies that create two separate but almost simultaneous exposures of the breast. This technology allows radiologists to image contrast-enhanced areas of blood flow through angiography of the breast using an IV iodine contrast agent. The contrast helps visualize localized increased blood flow pointing to areas of potentially cancerous lesions. With CESM, radiologists receive two mammographic images: one that looks like the standard mammogram and a second image that shows the contrast-enhanced areas that can help locate lesions. CESM reduces image noise, not only highlighting lesions but also helping reduce false-positives, according to GE Healthcare. In early clinical trials, CESM discovered more cancerous lesions and accurately measured the size and location of lesions to help plan surgery and treatment. While mammography is considered the standard for front-line breast cancer screening, image sensitivity and specificity can be affected by things such as dense breast tissue. Dense overlapping tissue can encumber securing clear images with traditional mammography. That’s one area where the company believes CESM can play a role in breast cancer screening and diagnosis for certain women. As clinicians continually look for breast cancer screening and diagnostic tools, the key is finding something that leads to an easy, early, and accurate result. Constance D. Lehman, MD, PhD, FACR, a professor and the vice chair of radiology at the University of Washington Medical Center, says that while working on the development of CESM, participants considered a combination of the best of contrast elements with the best of digital mammography. Another factor in the development equation was whether the new technology would be accessible to women living in rural areas, Lehman says. Women who live outside city limits and suburbs often do not have ready access to more sensitive MRI, but they do have more access to mammography. Lehman sees CESM as a potential tool for use with women at high risk of breast cancer and those with dense breast tissue or a family history of the disease. In addition, this technology could be useful in staging women who have been diagnosed with breast cancer. The contrast information could help doctors better understand the extent of disease and plan a course of treatment. This new tool could even play a role in the exams that follow a woman’s course of breast cancer treatment. MRI remains a viable option for women with irregular, uncertain mammograms, LeGrand says, but there’s the expense and level of patient discomfort as well as access, especially in rural areas, to consider. For the patient, a CESM exam is similar to that of a mammogram, since it requires breast compression to obtain the images, but it introduces contrast. The exam takes less time than MRI, where a patient must lie still and undergo a longer process to obtain the images. For the user, again, it’s similar to completing a mammogram and involves the same equipment upgraded to include the CESM technology. The dual-image CESM process does not significantly add to the typical mammography process time and often can be conducted by the same staff using existing equipment. In addition, because these images are so similar to standard mammography, they are easily read by radiologists and oncologists familiar with mammography. In many cases, CESM can be performed the same day a woman has her regular mammogram, and she can leave the facility with her results. Lehman says the familiarity is significant because major changes to what patients are accustomed to can mean that that newer applications may not be accepted and implemented among the general population. “This process isn’t adding further anxiety to an already stressful environment for women,” LeGrand says. Feedback from technicians and radiologists is that it’s easy to use and fits into their existing workflow. When it comes to its diagnostic capabilities, however, there is a positive difference. “From a level of diagnostic confidence, CESM means the difference between obtaining some very important information vs. a confusing amount of noise,” LeGrand says. GE Healthcare launched SenoBright in 2010 in Europe and some countries in Asia, and the technology is already in use in mammography centers in France, Spain, Italy, Belgium, Germany, Austria, and Japan. LeGrand says excitement is growing in the United States and that she expects there to be early adopters of CESM. Clinical research continues, with further consideration regarding training and enhancements to the technology as well as thoughts of combining this with other modalities, such as tomosynthesis. — Kathy Hardy is a freelance writer based in Phoenixville, Pennsylvania, and a frequent contributor to Radiology Today.